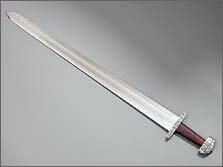 Posted: Tue 29 Jun, 2004 6:10 pm Post subject: Contest: Clontarf Viking Sword Giveaway! Here we go again! Another quality sword will be given away right here on myArmoury.com!! This time, it's an Albion Armorers Next Generation Clontarf Viking Sword! This excellent sword is part of Albion's Next Generation line and represents an authentic, hand-crafted, fully-functional sword based on extensive research and testing of museum originals. Albion donated this sword for this contest, both supporting our Web site and the comradery that defines our community! 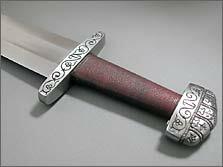 This style of Viking era sword is referred to as a Type K hilt in Petersen's Typology, due to the distinctive five-lobed pommel and straight guard. Find places for this hilt form are broadly distributed across Europe and as far south as the Balkans, dating from the late 9th into the late 10th centuries. The hilt components are investment cast in mild steel from original waxes carved by Leif Hansen under the direction of Peter Johnsson, based on Peter's first-hand examination and documentation of period originals of this type. The blade is classified as a Geibig Type 2 (which some consider a sub-classification of the Oakeshott Type X), hand-ground from 1075 steel to a fine satin finish, heat-treated by hand in the Albion Forge Shop. The sword has a retail value of nearly $700 US! For complete details about this sword, read our hands-on review by Bill Grandy. Post a reply in this topic telling why you want to be a Viking! You must be joined prior to Monday, August 9th, 2004. All participants will be entered into a drawing and the winning name will be randomly selected soon after the contest close. Shipping charges will then be calculated, and upon receipt of said shipping charges from the winner, the sword will be shipped. If you did not post why you want to be a Viking in this topic (see #4, above) then you are not eligible to win! This contest is sponsored by Albion Armorers. We at myArmoury.com want to thank their gracious generosity for this fantastic prize contribution. Please read our detailed Rules and Limitations document for complete information and our disclaimer. Posted: Tue 29 Jun, 2004 6:41 pm Post subject: WOW!!! Thanks again to Nathan and Albion for another great contest! I loved this sword when I saw it at Blade....gotta win this one! To go out at sea looking for a distant, unknown shore, storm ashore to carve out a kingdom of my own through sharpness of wit and sword and strength of arm....to become legend. the warring! the wenching! the ale-drinking! Whats not to love? Anyone ever heard that Ray Stevens song ; "Erik the awful"? Erik the awful, the brutal and tenacious........ Erik the awful mercy sakes, goodness gracious.... you can run but you cannot hide......"
Oh and lets not forget the Chicks!! I mean what woman WOULDN'T want a man who wears animal fur legwarmers in public! Not to mention the phallic shaped helmets with horns! Those guys had it made! Greetings All, Here is my post for why I would like to be a Viking. Let me count the ways. I would love to add the Clontarf to the company of my A&A Shifford and newly accquired ArmArt S36 type H viking sword. It would also be the first Albion I would own not being able to afford or plunder one. Norse has been my new area of study for a bit now. I have made it through most of the Icelandic sagas and have just finished the Volsung saga. 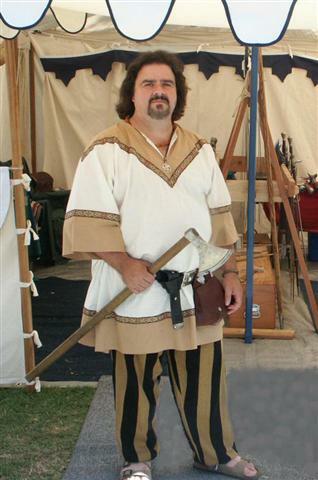 I am working on my Viking kit for the Texas Ren. Fest. this year. P.S. I also know this is based on the Kilmainham sword found in Ireland. I have pictures of it. Being part Irish, I think this all fits together. I'd like to be a Viking because of the freedom. . . the freedom to show up on some unsuspecting shore, set fire to all of the thatched material, then haul away assorted plunder. Oh, and I'd obstinately wear a prodigiously horned helmet, just to contradict the naysayers!! 1. Swords, spears, axes and, shields. 2. Saying Aargh! repeatedly and then burning things down. Why would I want this sword you ask? 2. It's sharp and pointy. 3. It would give me great pleasure to brandish it, say arrggh repeatedly and then go... put it down before I poke someone's eye out. Vikings had all the fun. Other than that, I just don't know. And why do I want to be a viking? Why DON'T I want to be a viking? I mean, come on... you're a man's man, a warrior's warrior. Their culture fascinates me, as do their weapons. The sword is my companion. Why do I want to be a Viking? I'm already a Viking! 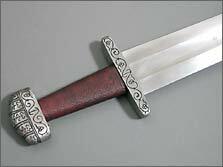 At least I reenact one quite often as a member of Regia Anglorum, and this is a beautiful sword that would look really nice with my kit. I was so excited about the contest that I forgot to tell why I wanted to be a viking. Because Vikings didn't need no stinking full-size cross-guards. And because they called things as they saw them. What other culture would approve of naming swords things like "Leg Biter?" Just out of curiosity, does this one come with sheath, or no (not that it matters, but if I don't win, I might look one of these up anyway! BTW, I'm sure all the folks here know, but Albion also sells a bunch of Jody Samson's stuff, and all of his pieces are some of the best around. "The Universe is a big place, perhaps the biggest..."
Don't forget to tell people why you want to be a viking (#4 in the "How to Enter" list, above) to complete your entry. Well, I think I would make a good viking. Big, Hairy and love whacking things with swords! Why would I want to be a Viking? To be able to travel to many of the lands I would like to visit, like Ireland and Scotland. To be one of the first people to discover my future homeland. To be able to take proper revenge for a fallen comrade. And the best reason....The Valkyries!!! Why do I want to be a Viking? Well, there's the plundering, the sword swinging and the heavy drinking... why would anyone NOT want to be a Viking?! Posted: Tue 29 Jun, 2004 7:30 pm Post subject: Go A Viking ! Actually, I want to be a Norseman and go a viking ! I am not new to collecting weapons, but I am new to swords. I think the Viking sword would be a great start to a collection! I am Scottish, from the Clan McDonald, who are descended from Viking raiders on the west coast of Scotland. This may be the only link I have to the Vikings, but I hope it will be enough to win the contest! Take care all, and good luck! Did I forget anything...OH YES...I like to raid border villages far from home...like, eh, Columbus. Yeah, I'd be a lame viking, but I'M STILL BIGGER THAN EVERYONE, BY THOR'S MIGHTY FLATULENCE!!!!!!!! I want to be a Viking so that I can go berserk without offending my neighbors. I also envy their footwear, which looks a lot more comfortable than what I can buy today. And I also like the look of runic inscriptions - if I win the sword I will be tempted to have it inlaid with a suitable message spelled out in runes.